Louis Vuitton Top / Blouse. Authenticity guaranteed, new Louis Vuitton Blue and red long sleeve top / sweater. 100% Merino Wool and 100% Silk. Has 3 Buttons on top of one shoulder with "louis vuitton" engravings. Has an extra button and thread attached inside the tag. Tag says XS and would probably fit Small or around 3, 4 5, woman. Please compare the measurement below to make sure this will fit you. Measurement is approximate, taken flat not stretched and all in inches: shoulder across: 15 in. Length (top of shoulder to bottom) 25.5 in. CONDITION: This is new but has been in storage and it develops some creasing or wrinkling. Overall very beautiful, good quality and stylish. Please view all the pictures below to better evaluate the quality and condition of this item. Add a map to your own listings. The item "NWT Louis VUITTON Merino Wool Blue Long Sleeve Sweater Top Blouse xs S 3 4 5" is in sale since Wednesday, March 02, 2016. This item is in the category "Clothing, Shoes & Accessories\Women's Clothing\Tops & Blouses". 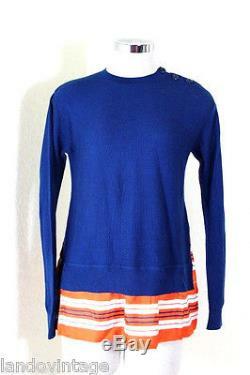 The seller is "landovintage" and is located in Rancho Cucamonga, California. This item can be shipped to North, South, or Latin America, all countries in Europe, Japan, Australia, South Korea, Indonesia, Taiwan, South africa, Thailand, Hong Kong, Israel, New Zealand, Philippines, Singapore, Saudi arabia, United arab emirates, Qatar, Kuwait, Bahrain, Malaysia, Bangladesh, Brunei darussalam, Egypt, Jordan, Cambodia, Sri lanka, Macao, Maldives, Oman, Pakistan, Reunion.